NEW! As we approach the celebration of the glorious Feast of Easter it is a time when we recall Christ's sacrifice on Calvary's hill and the great gift of our redemption. 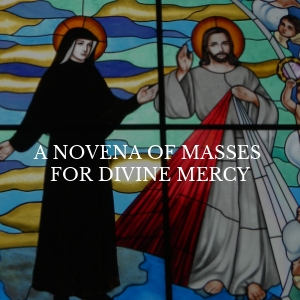 It is with this in mind that we are delighted to offer a special Novena of Masses for Divine Mercy. Rev. Father Raymond Atube, a priest of the Diocese of Gulu, Northern Uganda, will celebrate this Novena of Masses beginning on Holy Saturday, April 20 and ending on Sunday, April 28th, during the vigil of the Feast of Divine Mercy. He will be praying for your loved ones and for the intentions requested by Our Lord to St. Faustina for the Novena. If you have not yet entered the names of your loved ones for this novena, please click here. Let us together pray for Jesus to flood our land with His ocean of mercy and His peace for as He promised, "mankind will not have peace until it turns to the Fountain of My Mercy."